Former Governor Jeb Bush was in Punta Gorda Wednesday to commemorate the 10th anniversary of Hurricane Charley. The category four storm killed eight people in Florida and destroyed a large part of the state’s southwestern coastline. 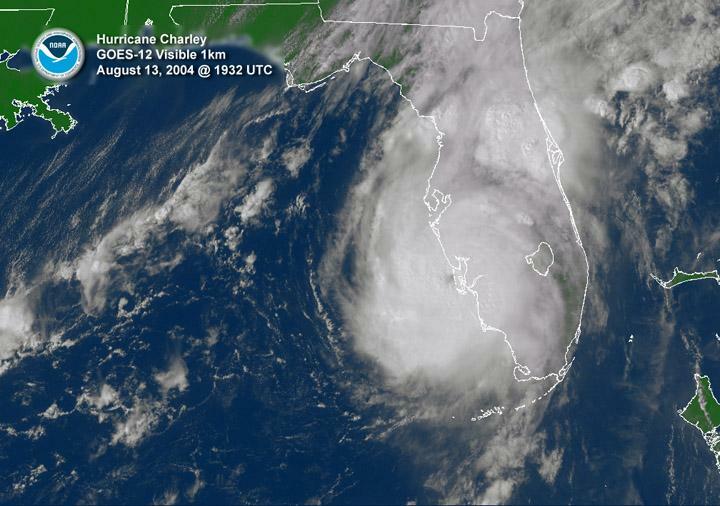 August 13th marks the ten year anniversary of Hurricane Charley hitting Southwest Florida. The storms trajectory had initially led forecasters to predict landfall near the Tampa area, but residents were caught off guard as the Category 4 storm made landfall on Captiva Island and headed toward Charlotte County. Damage from Charley resulted in more than $13 billion dollars in damage. We’ll explore how Hurricane Charley impacted Charlotte County and what emergency planners and utility providers learned from the storm. We’ll also take a look at both the negative and positive environmental impacts of powerful hurricanes on Southwest Florida. If you experienced Hurricane Charley here in Southwest Florida 10 years ago, what are your remembrances of riding out the storm? How did the experience impact how you prepare for hurricane season? In a matter of hours August 13th, 2004 Hurricane Charley demolished historic downtown Punta Gorda. Brick shops collapsed. Glass office buildings were blown out. Thousands of mobile homes destroyed. WUSF’s Bobbie O’Brien arrived in Punta Gorda about 12 hours after the hurricane to report on its impact – and she went back a decade later to find a revitalized town. It's been ten years since Hurricane Charley took a hard right turn and unexpected slammed into Punta Gorda, before tearing through Central Florida. We take a look back at the devastation, with features from a re-visit to Punta Gorda and Arcadia, to see how they've recovered since the storm. We also take a look at how insurance rates were affected by the storm. And we interview former WGCU anchor Valerie Alker about how she rode out the storm while trying to host Morning Edition.